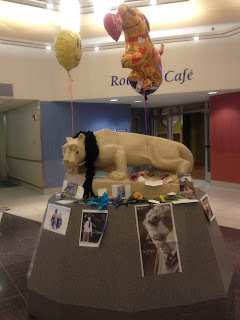 Morning after, Day ahead...: "He died as he lived..."
...the first phrase from a statement released by the Paterno family in regards to the death of Joe Paterno, legendary Penn State football coach, who died on January 22, 2012. As recently reported, Joe Paterno died from metastatic small cell carcinoma of the lung, an aggressive and rapidly growing malignancy of the lung that affects 20-25% of the US population. Prognostically, 65-70% of those with small cell carcinoma have disseminated, extensive disease at the time of clinical presentation... which unfortunately is incurable. Since the dawn of the "Penn State scandal", many have questioned if the events surrounding the scandal and the abrupt firing of Paterno worsened his health status leading to his death. No one will never know. Can you die of a broken heart? Can emotional stress kill you? No one knows for sure. However, emotional stress and chronic pain can indeed decrease your body's immunity, making it harder to restore physiological balance once compromised. So, from my perspective the recent events prior to his death surely did more harm.